Chicken Salad is a staple at our house. 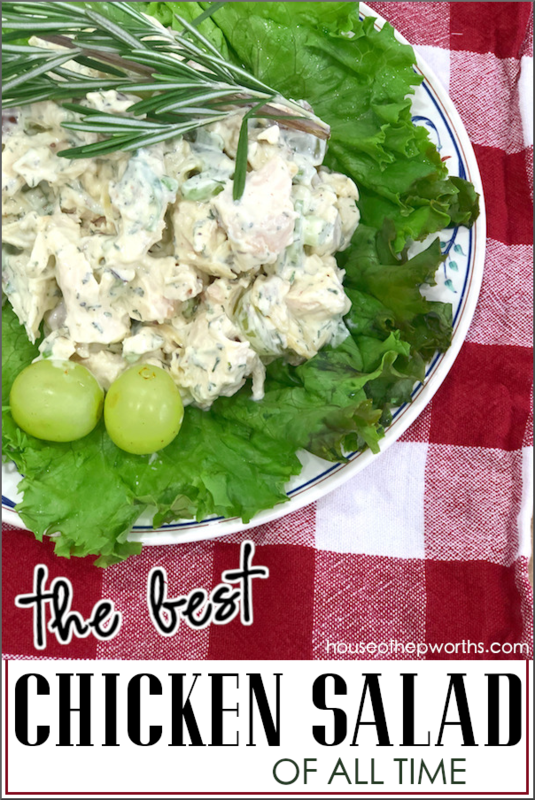 Today I’m sharing the most amazing Chicken Salad recipe you will ever taste. Not only is it delicious, it is quick and easy to make and is low-carb to boot! I know it sounds too good to be true, but it is true. I LOVE chicken salad on a bed of leafy green lettuce. I have tried dozens of recipes. After finding one I mostly liked, I tweaked the recipe until I came up with this masterpiece. This recipe is easy and extra tasty because of a secret ingredient… rotisserie chicken! My favorite thing to do is purchase a rotisserie chicken (from Costco) and pick all the juicy tender meat off for my chicken salad. 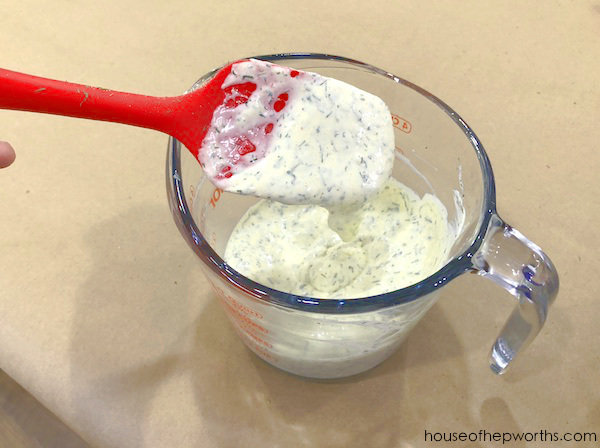 This not only saves time, it makes the salad even more flavorful. Making this salad takes 30 minutes or less, depending on how quickly you can chop up a handful of ingredients. The chicken salad is two parts; the sauce and the base. Start by prepping the sauce so it can chill while you prep the base. 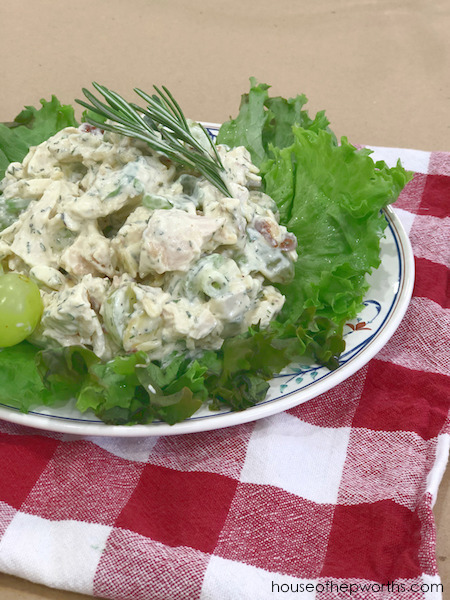 Next, blend the sauce for your chicken salad together in a small mixing bowl and allow to chill in the refrigerator while you prep your base. 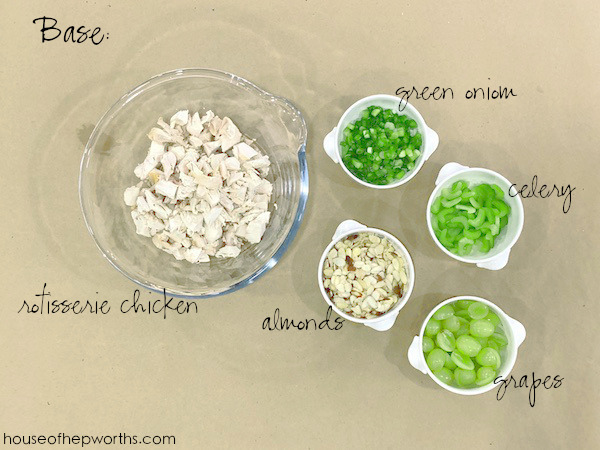 For the base, start with your chopped rotisserie chicken. 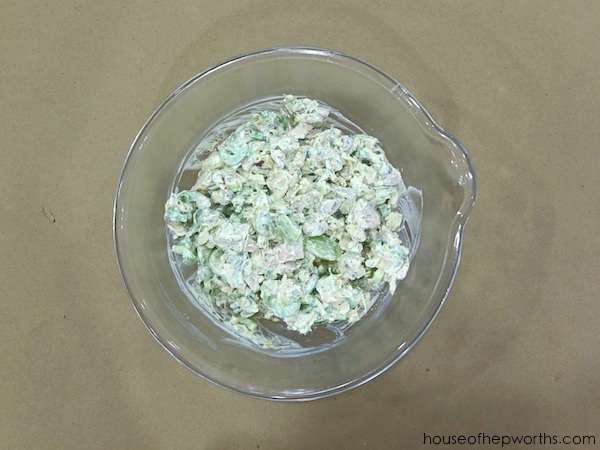 This is the main ingredient in your chicken salad! Your chicken can be prepped in advance. Usually I will pull all the meat off the rotisserie chicken and store the meat in the refrigerator. When I’m ready to prep my salad, I quickly chop the chicken while I chop the other ingredients. 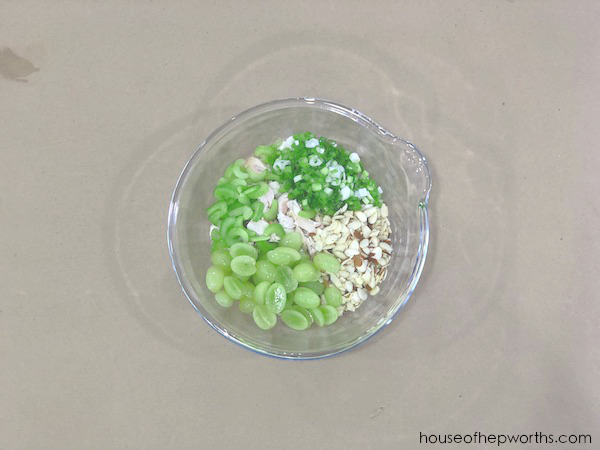 Another ingredient that turns up the WOW factor of this salad is the grapes. They add just a hint of sweetness. Mixed with the dill and mayo, it’s a winning combination. 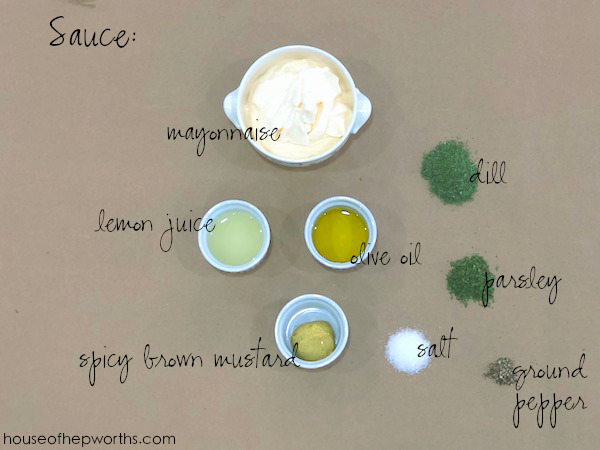 Once you mix your base ingredients, pull your sauce out of your refrigerator and gently fold into the base. Make sure it is well mixed. Your chicken salad is now ready to eat! I advise you to let the salad chill in the refrigerator for at least 30 more minutes once it’s fully mixed. This allows the flavors to mesh together and your salad to get crispy and cold. Serve over a bed of lettuce. For even more flavor, add a few chopped cherry tomatoes on top. 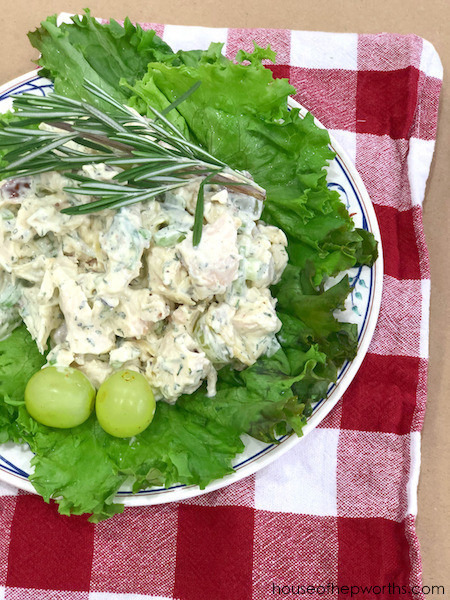 If you manage to have any leftovers, this amazing Chicken Salad tastes even better the next day! Storing in the fridge overnight allows all the flavors to blend together more fully. You can also serve this salad between two slices of bread (sourdough is the best!) for a delicious sandwich. The most amazing Chicken Salad! Combine Sauce in a bowl. Set aside and refrigerate. While sauce is cooling, remove all chicken meat from the rotisserie chicken. Chop meat and place in a large mixing bowl. Add remainder of Base ingredients and combine well. Once combined, gently mix sauce into base until well mixed. Refrigerate for at least 30 minutes before serving. Serve on a bed of leafy greens with sliced tomatoes and avocado. Can also be served as a sandwich on bread with green leaf lettuce. 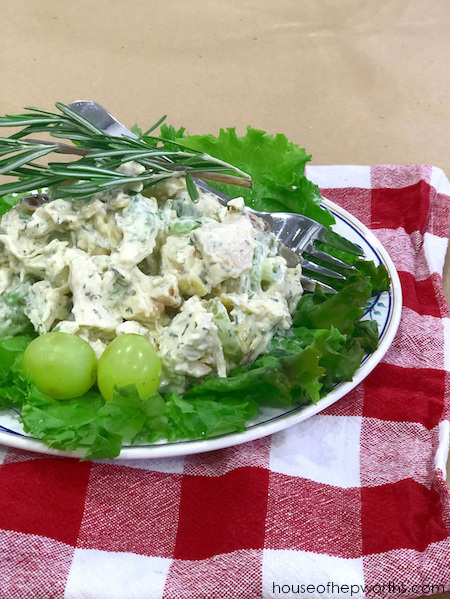 Let me know if you try this Chicken Salad and what you think of it! I think you will love it as much as I do! I try to make this salad at least twice a month at our house. Frequently I will purchase two rotisserie chickens and will double the recipe. This way we can have it for dinner and again for lunch the next day. The BEST Spinach Artichoke Dip ever! Here’s how I lost 35 lbs eating low-carb! Is the dill fresh or dried? I couldn’t tell for sure from the photo. I must try this as I am looking for something different for lunches and dinner. Love your blog and read often. Maureen, I use dried dill that I purchase in a little glass jar on the spice isle. Glad to see you back in my email box! I didn’t know how to find you! Love your blogs … thanks!